Support this site through our CafePress store! Thank you for visiting. This site has been a hobby of mine since August 2001 when I started with just an episode guide. 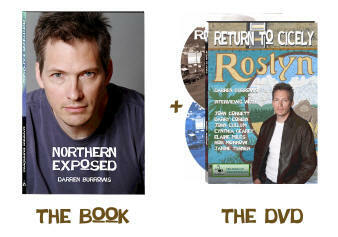 It's in a constant state of change (check out the What's New button, as well as the dates at the bottom of the pages). Please bookmark and come back often (sometimes, you might need to hit the refresh button to see new additions to a page). 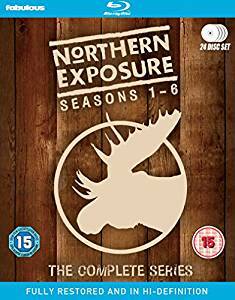 Through my facination of the television show, Northern Exposure, I have gathered many things. So short of opening my own NoEx museum, I instead developed this web site. So grab a beer or root beer from the Brick, and start clicking the links. Please drop me an email with feedback. If you really like what you see, I've added a tip jar there on the right of this page. It's not a cheap hobby and doesn't bring income, so every little bit helps to pay the hosting fees and keep it up and running. Or consider making a purchase through the Cafe Press link below or through amazon.com links (you don't have to buy something NX related, just click through the links on my site and it is completely anonymous). Thanks again for coming by and enjoy! UK Blu-ray HD set - Original Music! 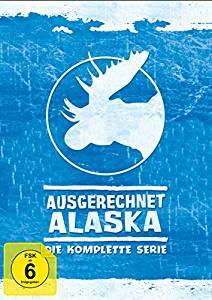 German DVD set - Original Music!